EU Imports of US Soybeans Were Rising Before Deal With Trump - Integration Through Media ....! (VOA): European Union imports of U.S. soybeans were already rising substantially before a top EU official told President Donald Trump last week that the bloc would buy more. EU Commission figures released Wednesday show that 37 percent of the bloc’s soybean imports last month were coming from the U.S., compared with 9 percent in July 2017. 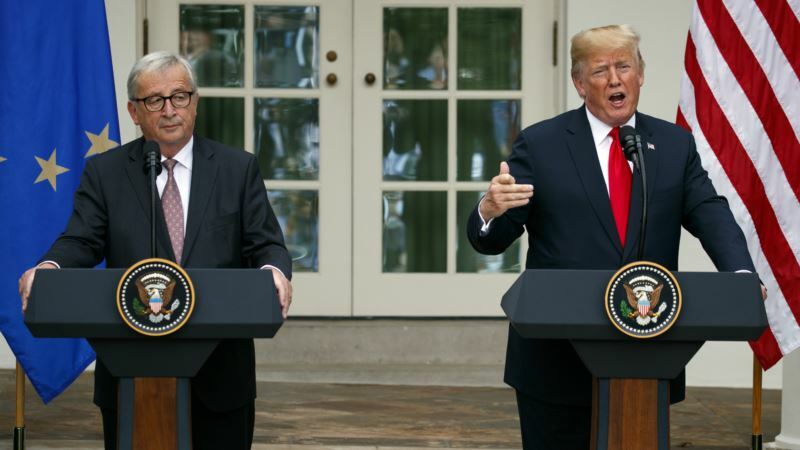 Amid a looming trade war over tariffs, Trump and Commission President Jean-Claude Juncker agreed on July 25 to start talks intended to achieve “zero tariffs” and “zero subsidies” on non-automotive industrial goods. The EU also agreed to buy more U.S. soybeans and build more terminals to import liquefied natural gas from the United States. “The European Union can import more soybeans from the U.S. and this is happening as we speak,” Juncker said. But a high level EU official said the increase in soybean purchases from the U.S. is due only to economics, as they are cheaper than imports from Brazil and Argentina. The official, who spoke only on condition of anonymity because of the sensitivity of the issue, said there was no political reason for the increase.